The DVD CNC project was conceived as an “enhancement” of an earlier project I’ve been mulling over in my head for the best part of the last 10 years (yes, my projects are THAT slow to materialize). 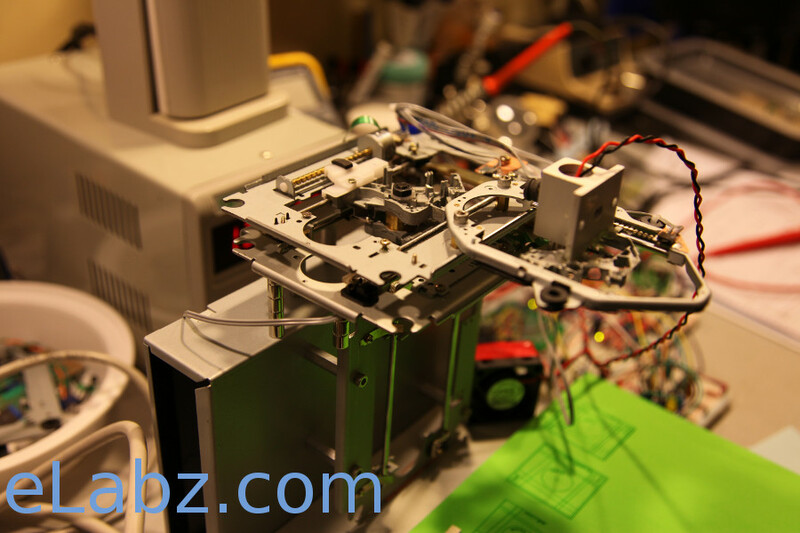 The project was tremendously helped by this Instructables which made me reconsider my previous idea of using more robust but very difficult to acquire anymore 5.25″ floppy drives and use parts of DVD-RW drives instead. So far so good, right? By the way, I’ve already posted the conceptual stuff about this project in this earlier post. I also added another feature: I wanted the piece of material being cut to be immobile so I can position a large sheet of foam and only cut 1.5″ square piece of it. Also, I had my sights on a possibility to burn some designs on larger wooden plaques which was also easier to do if you eliminate moving the material around. I was also thinking about eventually turning this into a 3D printer (and at some of the videos you’ll see it sporting a third stage, unused) and since a vat with UV-cured resin was to be involved, I wanted the effector head of the machine (in this case – the laser diode) to move around the material. In retrospect, it turned out to be much easier to just cut small 2″ x 2″ squares from foam and pin them down to the base with small magnets than it was to handle large 8″ x 11″ sheets of craft foam, so now I know that I can skip this requirement and won’t lose much. I also was never able to burn wood, except for balsa, so the large(ish) plaques won’t be mounted there either. I actually think that combining stacking of the linear stages with immobile material requirements has created the conditions that led to the failure of the project. 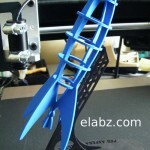 If your material is static, you have to move all of the hardware that comprise both axis around. That creates a lot of extra load on the linear stage that lies at the very bottom of that stack. In addition to the load, the moving part of the machine becomes larger in size and no longer rigid, which kills the accuracy, already not so great with DVD’s 20SPR stepper motors. So, the bottom line was that the accuracy of cuts just wasn’t there. I was never able to achieve anything close to the theoretically possible 0.125mm accuracy in cuts, especially along the overloaded X axis. 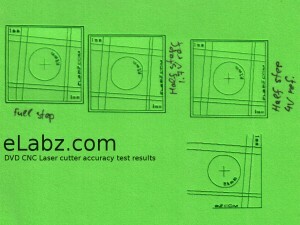 Take a look at the picture of the test cuts to the left (be sure to see the picture at full size). Note how the slanted straight lines are not actually straight and are rather sawtooth shape. The vertical lines were designed to have the top be exactly 3mm to the right from the bottom, which for the 3mm pitch lead screw of a desktop DVD stepper motor means one revolution of the rotor. In other words, one such line represents the full 38mm travel of the Y axis and one revolution (3mm travel) of the X axis motor. Horizontal lines are shifted 2mm because the Y axis in my cutter is using a laptop DVD stepper, which normally has 2mm lead screw pitch. You can literally count the exact number of steps the motor moves, and it just happens to be 16 for the smaller 16 SPR laptop DVD stepper of the Y axis and 20 for the slightly larger 20 SPR desktop DVD stepper. I have been experimenting for hours with various microstepping settings as well as voltage references of the EasyDriver bipolar stepper driver boards (which you see on the picture) and later with directly driving these steppers from H-bridges in half- and full step mode. But I could never quite get rid of the sawtooth cut profile and that was the deal breaker. Combining the tiny size of the model with inaccuracy just does not work. I did cut a couple of models on this cutter (all the originals were cut on a professionally made CNC router despite their small size) and none of the models could be put together – that’s how inaccurate the cuts were. 1. Research: I did not do enough initial research on the accuracy of the steppers. Knowing how difficult it is to accurately drive these tiny steppers, I would not have designed it with everything riding on the single stepper of the X axis. Note to self: Do more research before jumping in! Interestingly, the project was not a complete failure. Quite a few things were done in the course of this project that I will use in the future. I’ve designed, debugged, ordered PCBs and populated a few boards of the TTL-controlled laser diode driver which I will continue using in my future laser cutting projects. In conclusion, despite the failure to achieve the needed accuracy, no regrets about starting this project whatsoever. It was great fun, but I do really need space on my workbench! So, the little machine has got to go but the lessons learned will remain in this blog for my future reference. 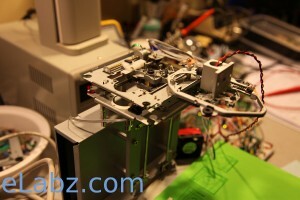 Hopefully someone else can learn how not to build a laser cutter from DVD parts from this blog post as well. 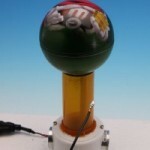 Just saw your article on hackaday. Could you upload the test pattern maybe? Looks nice and could become the standard test pattern for us diy laser guys. Hi Ian, thanks for stopping by! That sounds like a great idea, I’ll have to dust off some of the project files to find the pattern. I should have it in both SVG and Gcode versions, will upload as soon as I find them. Cheers! Ian, I have uploaded the Gcode for the test pattern here http://elabz.com/?attachment_id=1698 For some reason I cannot locate the SVG source but I’ll keep looking. 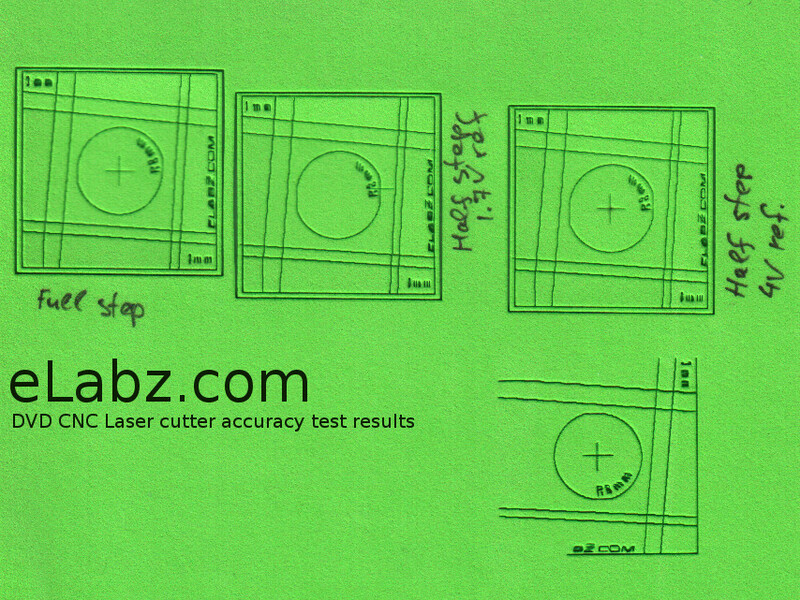 My CNC setup is in disarray now, I cannot test how the system of coordinates is defined – it could be in the center of the square, it could be in the left bottom corner, so be careful starting your cut. The whole thing is only 38x38mm though, so if you position it in a middle of the workspace of your larger cutter, you should be fine, but I thought it’s worth mentioning here in case someone cuts it on the actual DVD-based cutter. Thats a great write up.. I was also just beginning to build one for my college project. 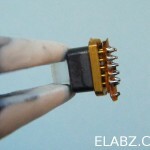 Its just great you have written about details that i should not miss..
Are you using the stock Laser Diode of the DVD with Aixiz housing? 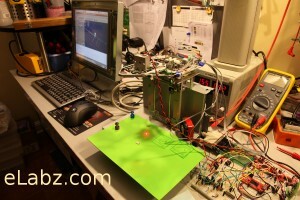 Rohit, yes, for this particular project I was using a laser diode from a DVD-RW drive with a standard Aixiz housing. I believe it was from a laptop drive, which was a rare find since laptop drives usually don’t have diodes in the form factor that works with Aixiz – 5.6mm can. Aixiz is not actually my favorite housing (more on that in the comments to this old post: http://elabz.com/laser-cutting-diy/ ) but it was just small and light enough for this project. Hi, I also ran into the “have too many old drives” problem. I did notice that the really ancient ones often have more powerful steppers though. Anyhow, I wanted to say that the most ancient CD drives you can get your hands on have DC motors, not steppers. Some older mechanisms are so primitive that one cannot help wondering how this all worked back then – absolutely no feedback, all rack-n-pinion, no lead screws etc. I did, however, find a very promising old (you can already call it ancient – it’s circa 1998) DC-motor based CD-R mechanism with optical encoder feedback and just generally awesome build quality – NEC CDR-1900A (manuf. date 05/1998) which I am anxious to try as a base for my next DVD CNC project. Well, OK, if it works, it would become CD CNC – even better! Great article. I wish I had found this a long time ago. I’ve collected all the parts that I think I need to make a CNC laser cutter. After reading this I think I will have to blow the dust off the box and have a go.